Well, that’s a mouthful. I basically listed all the ingredients you need to make this dish in the title. Anyway. Bobby and I made this (plus an obligatory apple pie) for a pseudo-Thanksgiving potluck when he came to visit last weekend. We actually didn’t have any of the ingredients necessary to make this dish, so we winged it. I’m going to list the ingredients I used, but I would highly recommend checking out the original recipe for the real thing. It’s pretty funny when you compare the two recipes, actually. Preheat oven to 400 degrees. 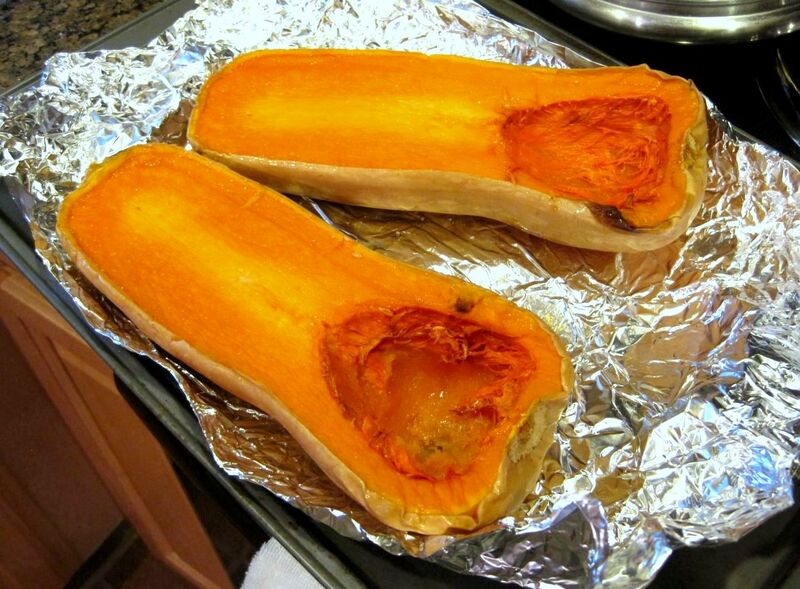 Cut butternut squash in half and scoop out the seed and guts. Brush tops with olive oil and bake face-up on a cookie sheet for 30-45 minutes, until soft. 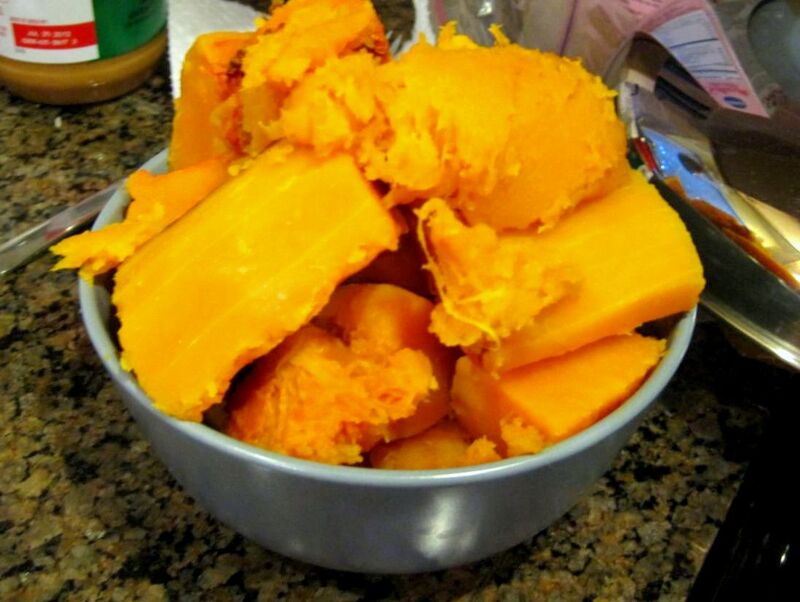 The original recipe said to peel the squash and cut into cubes prior to baking, but I hate peeling butternut squash with a passion. They’re slippery little buggers. And the cubes degrade into mush when you mix it into everything else anyway. Meanwhile, beat the eggs and mix in the heavy cream, wine, and oregano. 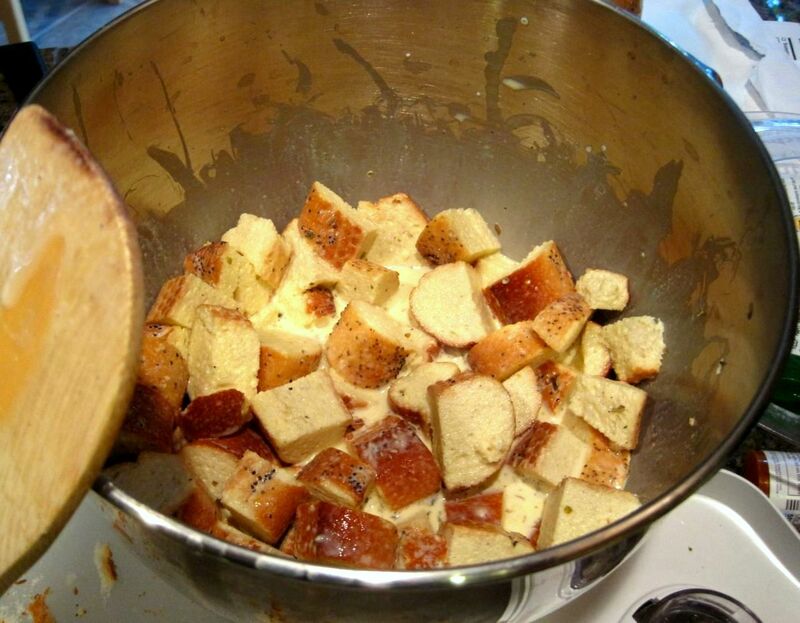 Dump in your bread cubes and mix to coat. Let sit for at least 30 minutes. My bread had poppy seeds that we tried to scrape off, with moderate success. Don’t accidentally buy a poppy seed baguette, kids. By this time, your squash should be nice and soft. Grab a spoon or a heat-resistant boyfriend and scoop out the flesh. You’ll want smaller chunks than in the picture below, else you’ll be munching on humongo pieces all dinner. Not that that’s always a bad thing. Decrease the oven to 350 degrees. Heat up the rest of your olive oil in a large pan and saute the onions and garlic. Add the Sriracha sauce, salt, and pepper to taste. 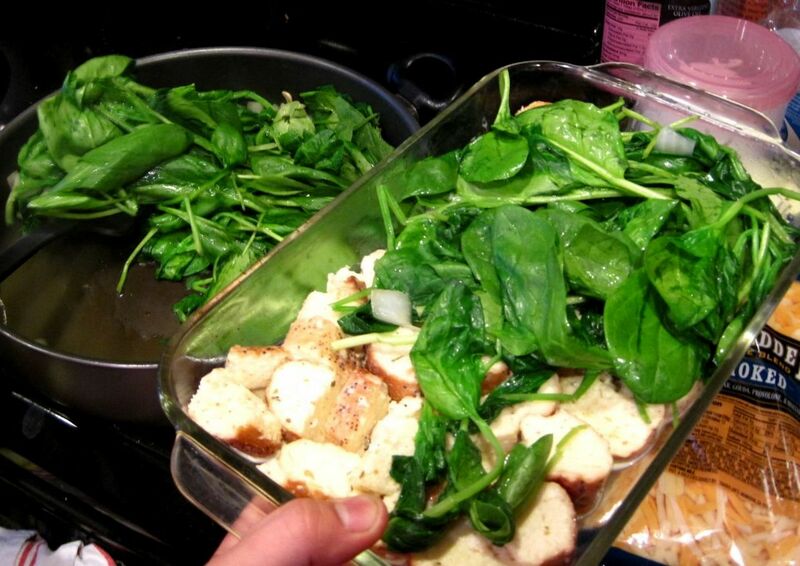 Add spinach and cover for about a minute. The greens should be wilted, but not bodiless mush. 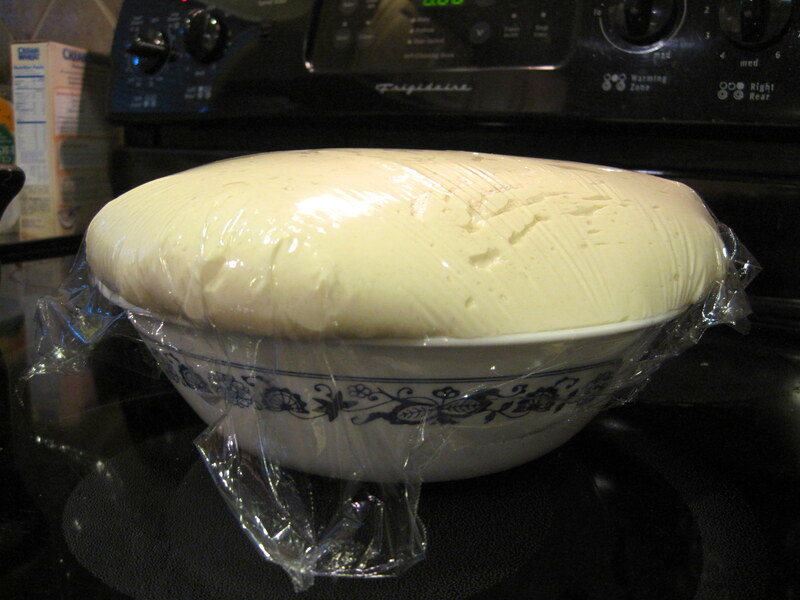 With a slotted spoon, transfer a layer of cream-soaked bread into a well-buttered baking dish. 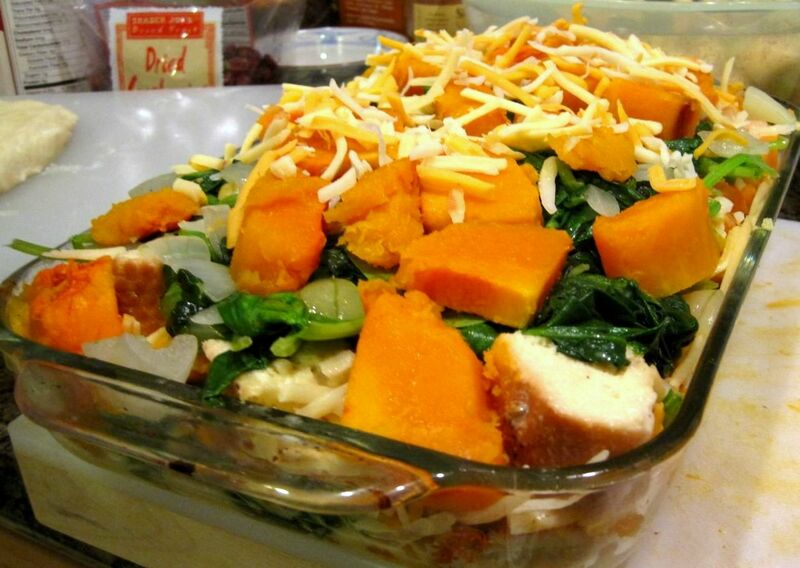 Add a layer of spinach and another of squash, then cover with a layer of cheese. Repeat until you run out of ingredients, then pour on the remaining egg ‘n cream. I wasn’t a huge fan of the bread pudding part because, well, it was my first time eating bread pudding. I hadn’t expected it to be quite so mushy. 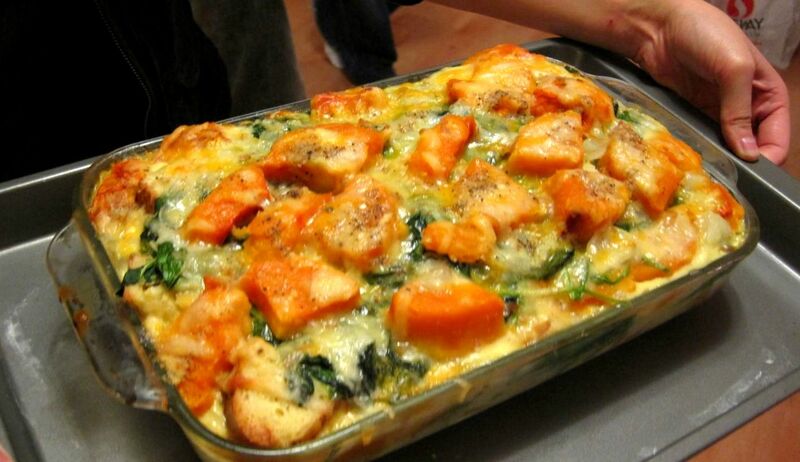 The spinach and butternut squash were incredibly tasty with cheese, though. Cranberry Oatmeal Cookies — Surprise, they’re vegan! At vet school, I’m one of the class secretaries. Funnily enough, I haven’t taken any minutes or scheduled any meetings. All I’ve done is bake. It’s the secretary’s responsibility to help people celebrate their birthdays, usually with baked goods. This has given me an opportunity to try recipes I normally wouldn’t, like lemon bars, cheesecake brownies, and these vegan cranberry oatmeal cookies. Guys, these things are out of this world. Fresh out of the oven, they’re crispy on the outside and chewy on the inside. They cranberry taste works surprisingly well against soymilk, and Bobby couldn’t tell that there were no eggs or butter involved. Try it even if you’re not vegan–they’re SO good! 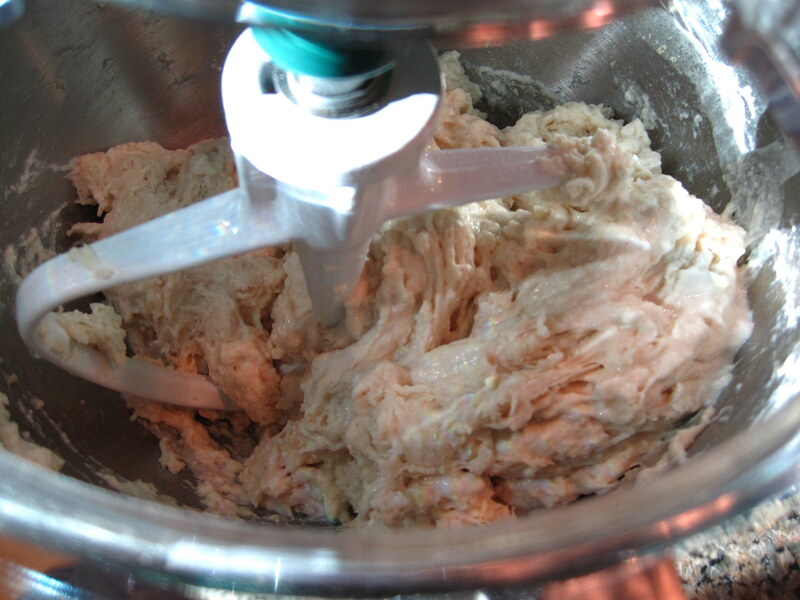 Cream together the margarine and sugars until smooth. Mix in vanilla and soymilk. For some reason, my batter became really chunky, like bad milk. I was pretty nervous about it–does margarine always behave like this? I kept mixing it, futilely hoping the chunks would homogenize themselves. 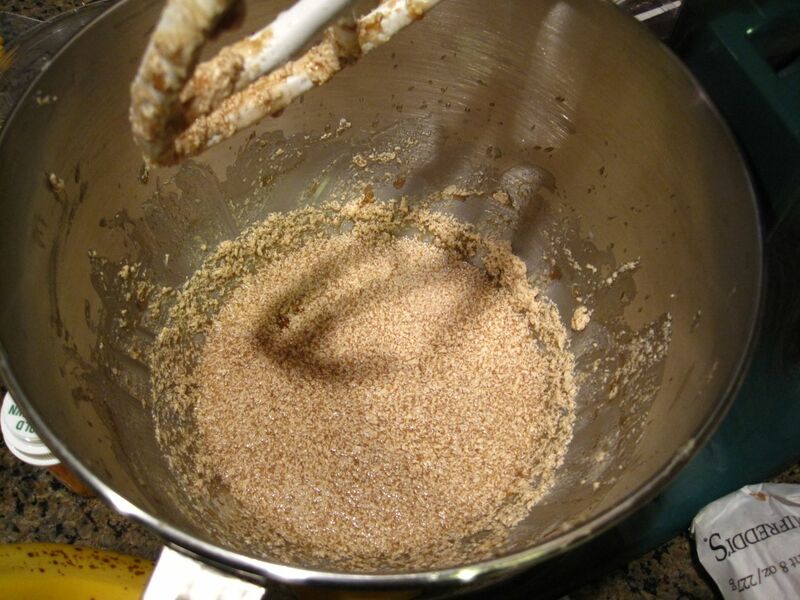 After about 5 minutes, I gave up and just added in the flour, baking soda, and spices. 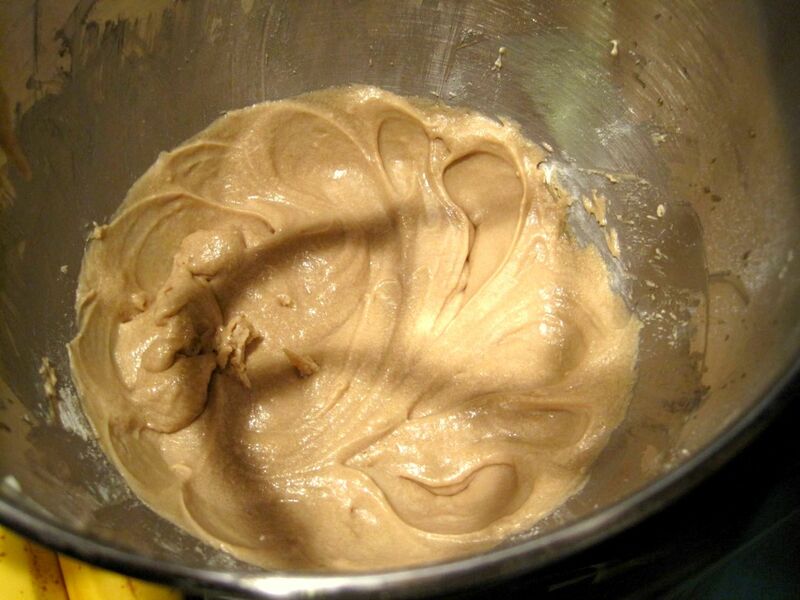 Surprisingly, I got a nice, smooth batter. Huh. Mix in the cranberries and oats. 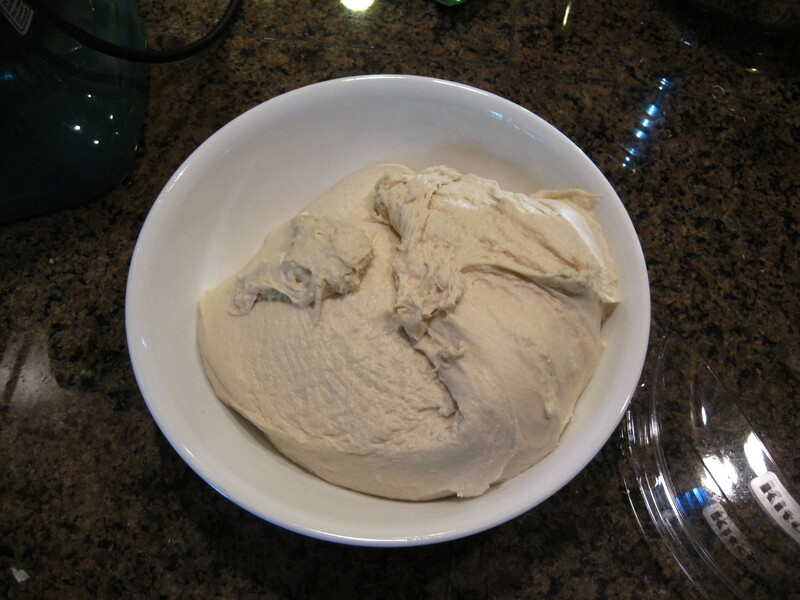 Spoon the dough onto a greased baking sheet. My cookies were pretty freaking huge…I used a quarter cup measuring cup as a scoop. An ice cream scoop would probably have been a better idea. Bake for about 15 minutes, or until the cookies are golden brown. The cookies will still be soft when they come out of the oven, but should crisp up after sitting on the baking sheet for 2-3 minutes. Ideally, you should then transfer the cookies to a wire rack to finish cooling. Since I don’t have one, I turned mine upside down on a cutting board. Check out that monster cookie. Om nom nom nom… The recipe makes 20 monster cookies or probably around 30 normal-sized ones. So this post is grossly overdue because all the bread has been consumed. Actually, all the bread was consumed about three hours after it came out of the oven, but I digress. 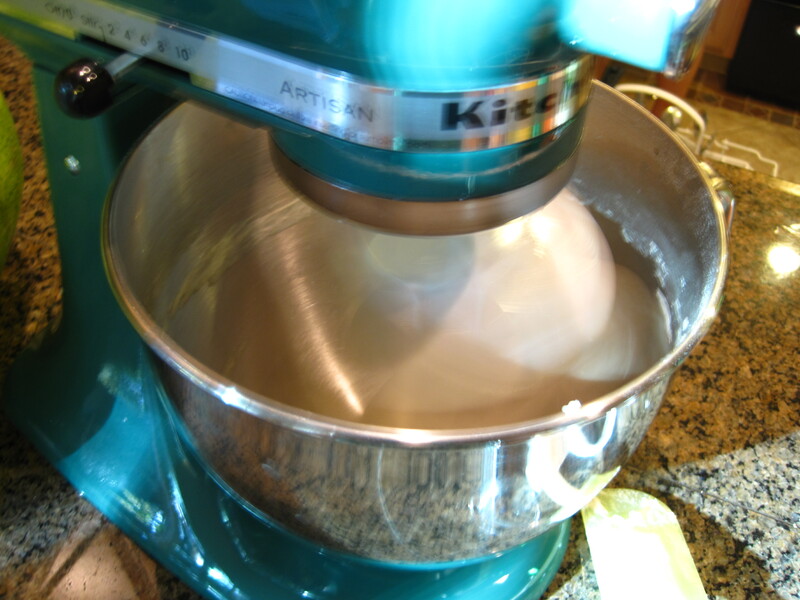 My parents got me a gorgeous green KitchenAid mixer (!!!!!) as a graduation present in June, but it wasn’t until I moved to Davis that I broke it in. 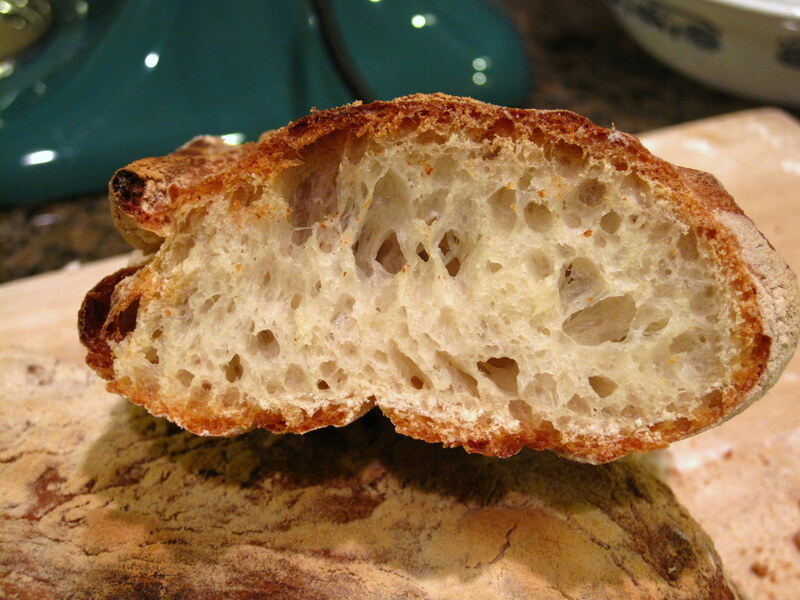 Using this recipe from Raccoon and Lobster (one of my absolute favorite cooking blogs evarr), I endeavored to make ciabatta bread. For some reason, my dough started climbing as soon as I switched to my dough hook. 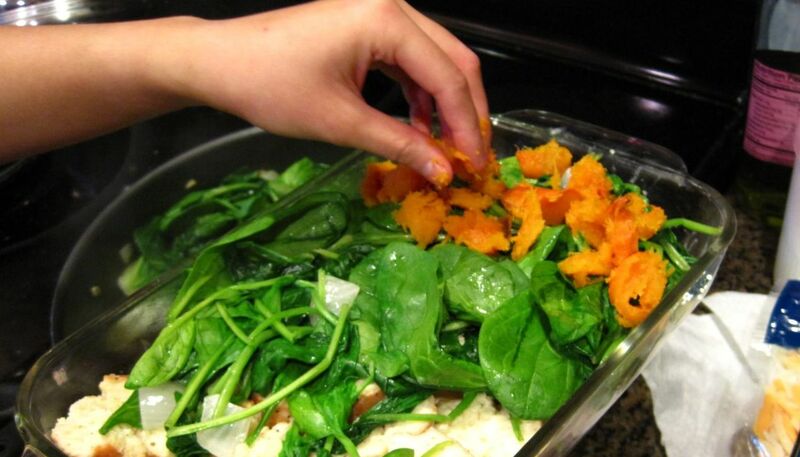 Within five minutes, it was peeling away from the sides of the bowl and thwapping away. I started studying for a bit, and the mixer would’ve fallen off the counter had my roommate not grabbed it. That’s what I get for being a nerd, I guess. I let the dough rise over the preheating oven which, in retrospect was probably not the best idea. The yeast went insane and tripled in something like half an hour. Oops. Yeah, okay that was insane. Anyway, I also went a little overboard with dusting the dough/baking pan. 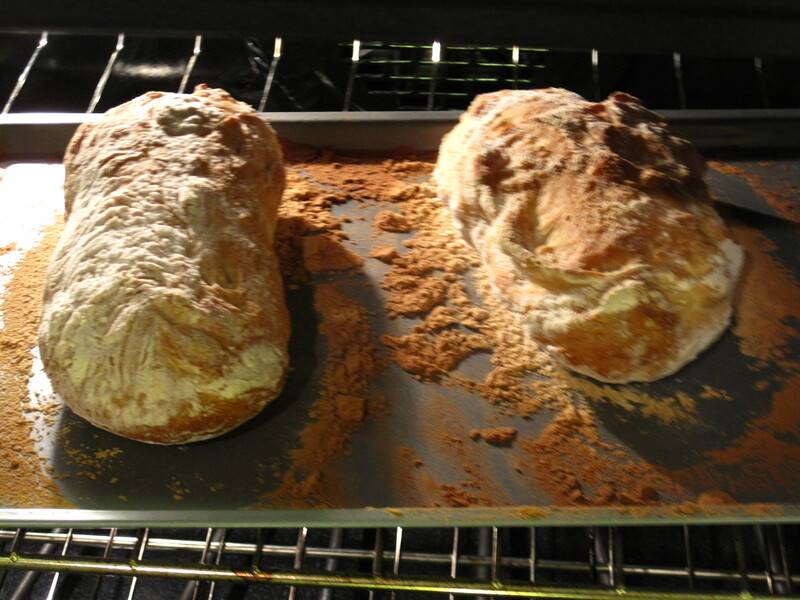 I was really afraid of the bread sticking and burning, so I covered the thing in layers and layers of flour. Sadly, I had no cornmeal. 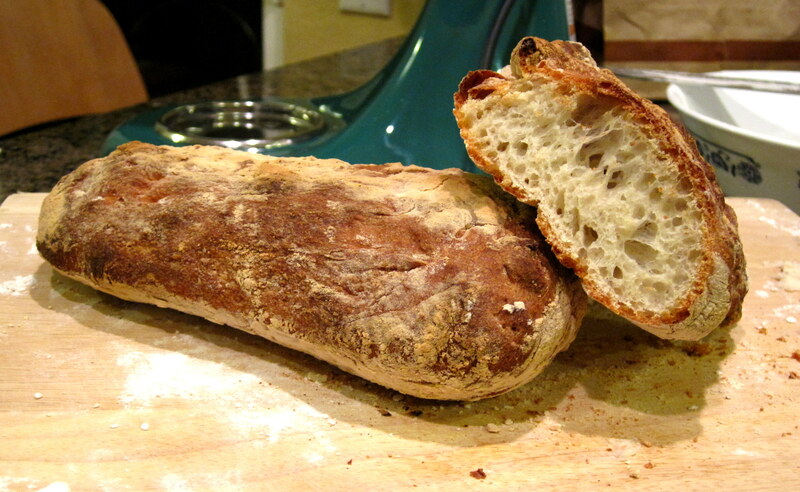 I ended up with a lot of burnt flour that could be tapped off when the loaf was cut. Rather successful for my second foray into bread-baking, I think. 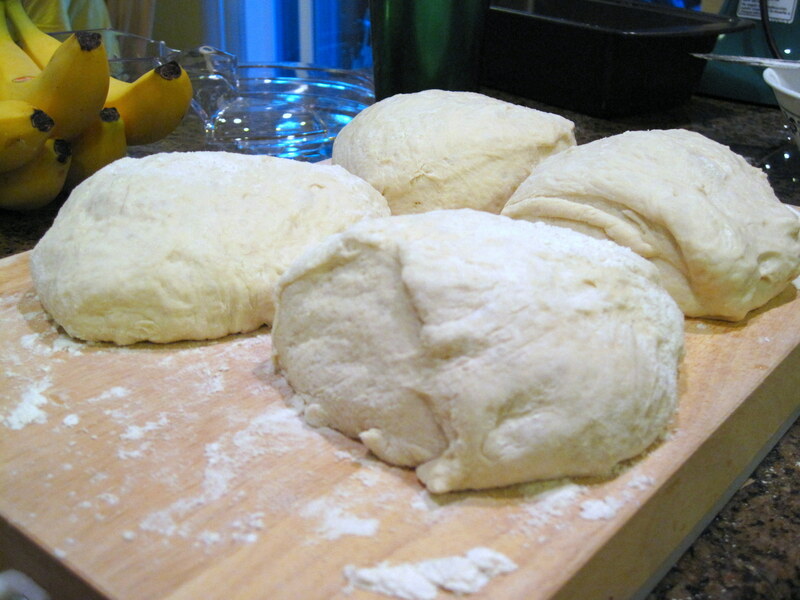 Next up…sourdough? There's a problem set due in six hours and an exam on Wednesday to study for, but you really can't muster up the willpower to crack open that textbook. We've all been there. Instead of submerging yourself in the depths of reddit or Facebooking people you don't even know, why not do something productive? You do have to eat, after all.